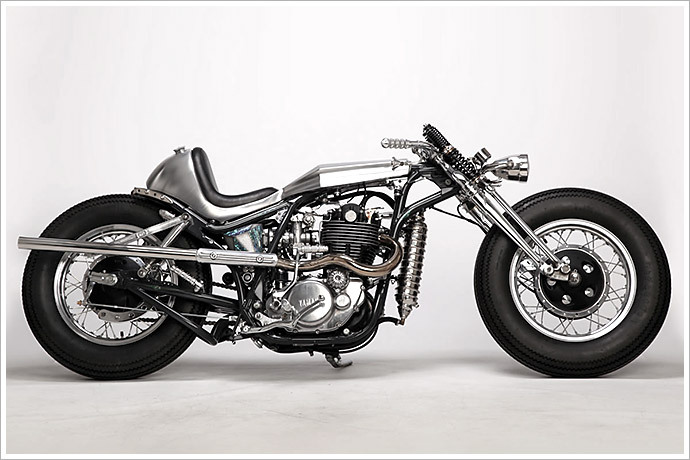 The Yamaha SR400 is still one of the most common bikes on the streets of Japan. It’s as Japanese as Sushi, Karaoke and Girl Pantie Vending Machines. Yamaha has been building these indestructable little thumpers for mucho decades, hardly changing a thing – until recently when they introduced the fuel injected models. I have a huge soft spot for these single cylinder SR’s, not just because I own one but because they can be easliy transformed into pretty much anything. We’ve seen most incarnations here at Pipeburn, mostly they’re turned into cafe racers, trackers or less commonly even bobbers. But we don’t usually see anything like this chrome creation built by Motor Rock. The guys from Nagoya have really taken this SR to the next level, building something truly unique. Sure, it has influences from Shinya, Zero and the samurai chopper, but Moto Rock have still managed to make it uniquely theirs. And we really love that.